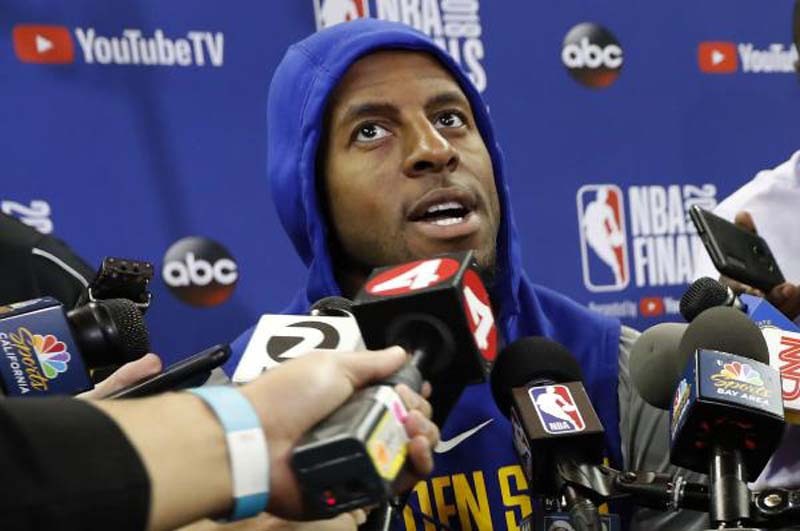 The Golden State Warriors will play Game 1 of the NBA Finals without forward Andre Iguodala. Golden State announced Iguodala's status on Wednesday. He was evaluated by the team's medical staff on Tuesday. "Warriors forward Andre Iguodala, who missed the last four games of the Western Conference finals after suffering a left lateral leg contusion/bone brunch I Game 3 vs. Houston on May 20, was evaluated by the team's medical staff yesterday," the team said in a statement. "The evaluation indicated that Iguodala is making progress; however, the pain that accompanies the bone bruise persists, as does inflammation of the nerve surrounding his left knee. He is currently listed as out for Game 1 of the NBA Finals and will be re-evaluated again prior to Game 2." Iguodala told reporters Wednesday that he is trying to "get back as soon as possible" and trying to "figure out how to move in general." "Making some progress," he said. "Slower than we expected, but we're just being realistic." The Warriors have traditionally used Iguodala to defend Cavaliers star LeBron James. "King James" elaborated on why Iguodala has had success against him when asked about his absence Wednesday. "I think it's, first of all, he has very, very quick hands," James told reporters. "That doesn't get talked about a lot. His ability to react to the ball either in the flight or while you're dribbling or while you pick the ball up. But at the end of the day, his athleticism allows him to play some of the premier perimeter players in our league. He's a guy that's 6'8", long wingspan, athletic. He's been like that since he was at Arizona. He's just added to his game every single season he's been in the NBA." Iguodala was the 2015 NBA Finals MVP. He averaged 7.6 points, four rebounds and 3.4 assists per game in last year's NBA Finals victory against the Cavaliers.